Condo, 1 bedroom + convertible bed, 1 bath (Sleeps 2-4). King size bed in bedroom, queen size sofa bed in living room. 840 square feet unit plus lanai facing west for great sunsets. Well equipped full kitchen with stainless steel appliances, washer/dryer, iron etc. 48 inch flat screen TV in living room with cable plus 32 inch flat screen TV in bedroom now. Unit remodeled in 2010, bathroom update in 2012 and new sliding glass doors in 2014. We do NOT list this unit on CRAIGSLIST. We live in Wichita, KS and have taken annual vacations at Kaanapali for 19 years, finally deciding to buy in the Mahana in 2012. We do NOT list this unit on Craigslist anywhere. If you see it advertised on Craigslist it is a fraudulent listing. Proximity to the beach and unobstructed views of the Pacific Ocean plus the islands of Molokai and Lanai. Ability to enjoy wonderful sunsets and cool ocean breezes. The Mahana is quiet yet has amenities such as a swimming pool and hot tub. Just a wonderful place to spend time. GREAT CONDO - Has EVERYTHING!!! This condo has everything! Great views, beautiful grounds, plenty of included parking and location, location, location. The kitchen is better stocked than mine at home. Adrian and Anne are very friendly and take care of every detail to make sure your stay goes as smooth as possible. Snorkeling equipment, beach chairs, beach umbrellas, boogie board, tennis racquets...all are included. Thanks Adrian and Anne for a wonderful stay. I have been to Maui three times with my wife. This time I was determined to find a place right on the beach with a good view, good beach, and good facility, and at a reasonable price. I found it! It is on the third floor so I can hear the beach and look through the palm trees. It is located in a great place near restaurants and where you can see the sunset each evening. We even saw whales and spinner dolphins a couple evenings right off the beach! In all my 30+ years of renting VBBO condos in Hawaii, and the gulf coast (Destin, Panama City, Gulf Shores) this was the best equipped condo I had ever stayed in. Best! It was very clean and everything was in top shape. There was an issue that was promptly cared for by the owner which I appreciate. This will be the only place I will ever look to stay at when I return to Maui in the future. Perfect condo in the perfect location with perfect view. Very hard to leave. Everything you need right there. All I can say is wow! Beautiful condo and gorgeous background. Condo was well supplied with all the things you need. 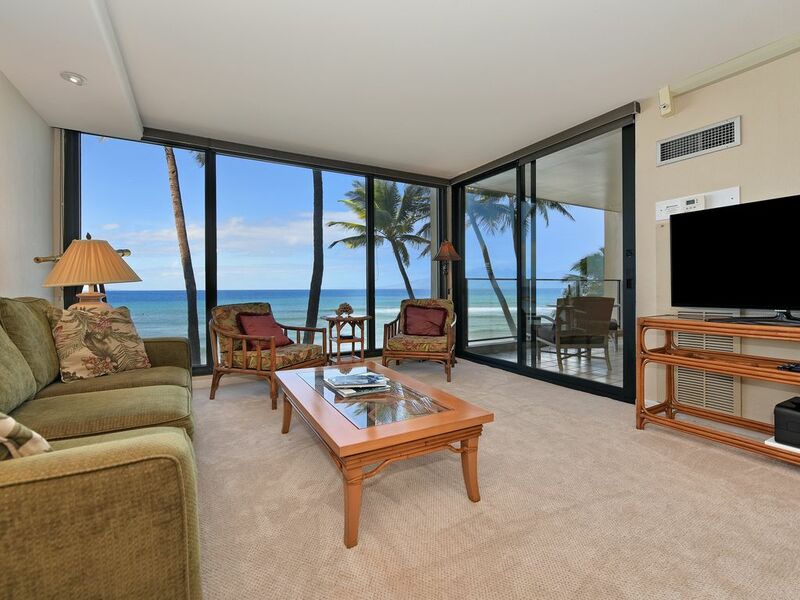 Location was perfect and centrally located for everything in Kaanapli . Owner was very prompt with any questions we had . My wife and I loved it !!! This condo has great views of the ocean and you can hear the waves crashing as you go to sleep. Loved this location of this condo! We saw a whale spout and a pod of spinner dolphins out the window. The owner of this unit does NOT list it on Craigslist. Fees $167 clean & set up. Add HI taxes GET 4.177% & TAT 9.25% for a total of 13.42%. Hawaii Tax ID TA-005-182-0544-01 & GE-005-182-0544-01. 5 night minimum, 7 night minimum for holiday, less OK to fill a gap.